I learn that David Legrand at Fraser Yachts has now taken on the central agency for sale of Modomarine's 29.8m motor yacht Free Life and there's a price reduction, too. 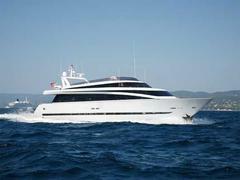 Delivered in 1995, the luxury yacht was built to ABS class, sleeping eight guests in a master, VIP and two twins. At her cruising speed of 25 knots, Free Life has a range of 900 nautical miles and, formerly asking €2.49 million, the superyacht's now priced at €1.75 million.